Trapped: Peoples’ Science Institute / SANDRP, 208 pages, Rs595. A Hindu legend has it that enamoured by her beauty, a demon proposed marriage to Kosi. The beautiful girl, in the guise of a river, said she would accept his proposal only if the demon could contain her within the Himalayas before the break of dawn. The demon worked furiously to stop the Kosi from flowing. Sensing the demon’s urgency, Kosi sought help from her father, Lord Shiva. Disguised as a rooster, Shiva crowed just before dawn, and the demon was fooled into believing that he had failed to fulfil Kosi’s condition. Often disturbed by those who have tried but failed to tame it, the Kosi is known to send out frequent warnings against human misadventure along its course. Trapped between the Devil and Deep Waters, development expert Dinesh Mishra’s timely, and painstaking account of the Kosi reads like a biography of the river—with details from scriptures, folklore, mythology and history—that debunks the myth that this river is the “sorrow of Bihar". Great civilizations grow along river banks, and it is true in the case of the Kosi. Bihar is the land that gave to the world great saints and messiahs in Gautam Buddha and Mahavir; the finest knowledge centres at Nalanda and Vaishali; and nurtured Jayaprakash Narayan’s total revolution. Unfortunately, such contributions have gone unnoticed in modern development discourse. Mishra lashes out at the politician-engineer-contractor nexus—the hydrocracy of our country—for having manipulated the Kosi’s course in the past six decades, causing displacement of millions of peasants in Bihar. 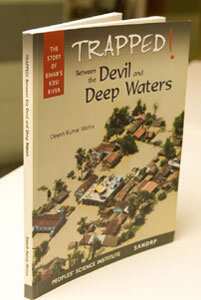 Trapped between the Devil and Deep Waters makes for compelling reading, unveiling the factors that have contributed to the trapping of more than 10 million people between the jacketed river and the water-logged area outside it. Mishra explains why the river has been flowing at a level higher than its adjoining mainland. Hydraulics formulae don’t seem to work in the case of the Kosi: The reduced cross-section of the river due to embankments was expected to facilitate the dredging of its bed. Instead, the Kosi offloaded silt into the river and raised the level of its bed. That the Kosi is among one of the highest silt-laden rivers in the country makes matters worse. Had the river been free to meander, it would have deposited fertile silt, collected from the slopes of Mount Everest and Kanchenjunga, across the plains of north Bihar. But that was not to be, as most of the silt carried over the years lies trapped between river banks, reducing the stream flow on the one hand and making the embankments vulnerable to breach on the other. Mishra also revisits historical records and official documents—the book is full of official statistics, political statements and voices from the grassroots, lending credibility to the argument that floods caused by this river are indeed man-made. The book also provides a list of possible solutions to the Kosi juggernaut. But Mishra's message is clear: If things remain the way they are, the worst lies ahead.